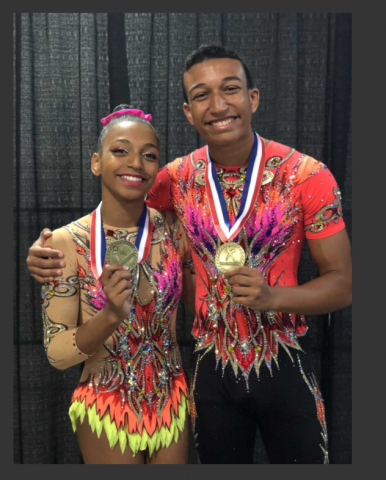 From acrobatic gymnastic newbie to expert in one year, Powell sibling mixed pair take gold at The USA National Championship Of Acrobatic Gymnastics. On July 28th, Nicole & Shawn Powell performed as a mixed pair in the USA Sports Acrobatic Championships in Greensboro, North Carolina and placed first in their age group to take home GOLD! Nicole Powell has been actively competing in Acro gymnastics for a little over 2 years, and was no stranger to success having been chosen as a delegate to represent the US on the international track at the International Acro Cup in Rzeszow, Poland (Oct 7-9 in 2016), and then being one of only four US acro pairs to take home GOLD, only two years into her Acrobatic career. On the other hand, her older brother Shawn Powell, though involved in athletics throughout his life had never taken up gymnastics, let alone Acrobatic Gymnastics, until earlier this year when he joined Xtreme Acro & Cheer in Rockville, MD. But through a strong work ethic, seven day a week practices that focused on strength training, tumbling, and routine practice to ensure his abilities were up to the task of national competition, plus tapping into a natural talent, he went from beginner to gold medalist in less than a year. Adding expert choreography by Arthur Davis, choreographer for Acro Army on America’s Got Talent, and the diligent coaching from head coach Juli Eicher, of Xtreme Acro & Cheer in Rockville, Maryland, it was confirmed that this sibling duo would take gold. The Powell pair have since been chosen by the USA Gymnastics selection committee to represent Team USA for 11-16 Age Group. Shawn and Nicole are the children of Dr. Maryam Seifi, owner dentist at StarBrite Dental in Rockville, Maryland. In addition to national and international competition, the Powel pair have performed gymnastics routines on behalf of StarBrite Dental to raise awareness and funds for the Special Olympics of Maryland Organization.